Our high performance biocides deliver superior performance and include both oxidising and non-oxidising biocides for complete water system control. To ensure that such systems are safe, well maintained and operate at optimum efficiency it is essential that the correct water conditions are maintained at all times. This can be achieved using carefully selected biocides. Our oxidising biocides include calcium hypochlorite, sodium hypochlorite, stabilised bromine, bromine and chlorine tablets, hydrogen peroxide silver, hypobromous acid and sodium bromide based bromine precursors. Activator 120 Cooling Water Activating halogen donor for use with Bromgard inhibitors & Accepa 2343 to produce bromine biocide in-situ. As well as these conventional biocides and disinfectants we also supply market leading chlorine dioxide solutions. Chlorine dioxide (ClO2) is a highly potent, fast acting bactericide and virucide that is effective at concentrations as low as 0.1 ppm. Chlorine dioxide does not form toxic by-products and is effective over a wide pH range in both hard and soft waters. 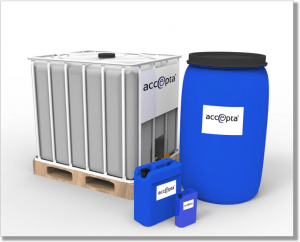 Accepta carries both conventional solutions of hydrochloric & sodium chlorite as well as the advanced Activ-Ox system which is an instant high yielding chemistry which is produced in solution without the need for complicated reaction chambers. For cooling towers where pack removal is too difficult Activ-Ox Foam Cleaner may be suitable, the high cling foam gives a deep clean disinfecting and descaling lightly fouled tower pack while the power of Activ-Ox Chlorine Dioxide effectively disinfects to removes bacteria and biofilm. The Bromgard product range represents the most up to date cooling water treatment products that bring together the latest scale, corrosion and fouling control technology with the biocidal power of bromine for applications in the widest possible range of cooling water systems. The superior effectiveness of bromine in controlling microbiological contamination in cooling water systems is well known, particularly in alkaline water conditions where the effectiveness of chlorine-based products diminishes rapidly. Solid bromine release products which dissolve in water and release active hypobromous acid. Mixing of two solutions; one a source of bromide ions, the second an oxidising solution, usually hypochlorite to produce a solution of hypobromous acid which is injected into the system. Both of these systems have disadvantages. The use of solid products does not lend itself to accurate control of bromine concentration and overdosing leading to significantly increased corrosion potential is common. The use of two solutions requires accurate mixing and injection systems for both solutions to ensure that dose levels are controlled. The introduction of the Bromgard range of cooling water products eliminates many of the problems that have been associated with the use of bromine and provides an all in one treatment to aid in keeping your cooling system running efficiently and safely. 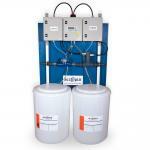 To find out how visit the cooling system inhibitors page.